App Annie has released its new report data tracking app downloads and revenue for the Google Play Store and Apple's iTunes App Store. As we have been expecting, Google Play's download trends have continued and led to the store overtaking Apple in Q2; but despite the download numbers, Google Play is still well behind on revenue. According to App Annie's new numbers, Google Play pulled in 10% more downloads than Apple's App Store, but Apple still generated 2.3 times as much in revenue. When the data was broken down by region, things haven't changed all that much. The U.S. and China are the top of the list for app downloads in the App Store, with the U.S. and Japan leading on App Store revenue. On the Google Play side, the U.S. and South Korea top the app download list. Japan, South Korea, and the U.S. lead on revenue and those three countries account for 70% of all Google Play app revenue. On iOS, games still lead the way on app downloads, accounting for 40% of all downloads and a whopping 75% of all revenue. However, music and social networking apps have been making a push in the rankings. 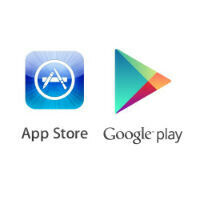 Google Play also saw games leading the way with 40% of downloads and 80% of revenue. The other big winners on Google Play were communications apps. This was a footnote in the article, "App Annie Intelligence revenue estimates reflect app store revenue earned from paid downloads and in-app purchases. They do not include revenue earned from in-app advertising." It took me a while to understand what these metrics represented, so I hope it helps. Lol. Who cares. Still Android phones are way way better than iOS Phones. Specially Samsung S-series. Haha. The same sentiments here, but in reverse. What is truth? You must be one of the most narcissistic people on the planet (hyperbole noted) if you think that your idea of what makes a great smartphone infallible truth. What truth? You stated an opinion, as did I. There's an easy way of dealing with this type: 1) See what his name is (in this case "Samsungadroidrules"). 2) Disregard everything he has to say as fanboyish propoganda. 3) The end. Revenue isn't everything by itself, but the marketshare difference is important. No that's not very accurate. If you compare the most popular paid apps side by side, you'll see Android and iOS are almost the same. It comes down to the type of users. iOS users spend more on apps the Android users. It's as simple as that. I'm going to be Captain Obvious here and say it's because android is vastly more popular in emerging markets. They won't stay emerging markets forever though and soon we will have a lot of people with wealth that have grown up with android. Revenue is far more important than downloads... Also google needs to work on their tablet apps because the iTunes store kills them in this area. It would be nice to know how the revenue is calculated: does it consider in-app add revenues? A lot of Android applications are ad-supported. Does it consider in-app purchases? Gaming revenue will change much more as Android tablets continue to increase in market share. Google's market is also much enhanced now, music streaming service, movies, magazines, it's only going to get better as more time goes on. The real question that upsets Apple is how much revenue could they have had if Android didn't exist. Staggers the mind thinking about it. I still wish someone big enough would buy WebOS and breath new life into it. Hate to see BB go under as well, they've done so many positive things for the mobile community. I'll take the money anytime. So... iOS users are paying twice as much for the same level of entertainment? As a consumer, It's an easy choice. Most of the apps are free on Google Play and same type of apps are paid (chargeable, that too high) on iCrap store that's why the revenue of Apple is high.